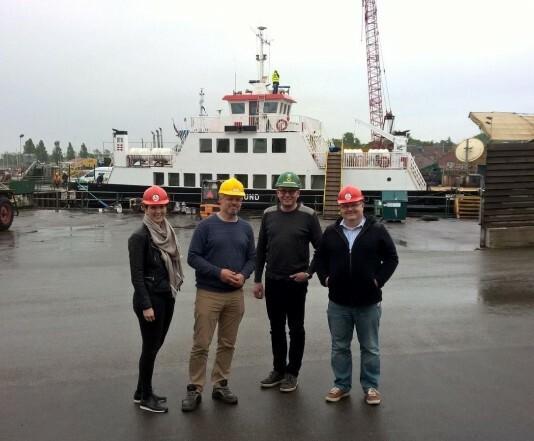 The main electric drive train team met in Soby shipyard on 24th May. The world biggest electrical ferry we are introducing many deeply considered features for propulsion and power plant system. These are for example safety and redundancy approach when designing DC-grid, operational principles when operating batteries-only power plant and especially the DC-shore charging concept. The Finnish electric drive train specialist VISEDO has been selected as the sole electric-system supplier for the world’s largest fully electric ferryboat to be built by the Danish shipbuilder Søby Shipyard Ltd. The ferry will be introduced in June, 2017 to transportation of vehicles and passengers between the island Ærø and the mainland in Denmark. The Finnish ground-breaking innovative electric drive specialist was preferred over the industry giant Siemens which was the previous candidate for the delivery. This article reprinted since News Page of Visedo Oy.